Becoming a mother is among the highlights of most women’s lives, but for some who can’t care for their young, it can be deeply saddening. In the United States, we have options, killing your baby excluded of course. There is foster care, adoption, and safe havens. All women don’t choose life, and to the pain of many, including the newborn baby itself, they allow their little ones to die unloved and unattended. In California, a helpless newborn baby girl was found deceased on the side of a highway, wrapped in what could only be assumed was her mother’s shirt inside a cardboard box. The tragedy struck many who heard about the little girl’s demise, gathering in commemoration of life that ended too soon. An unidentified person found Baby Jane Joe, as she was called, on the side of Interstate 15 in Corona, east of Los Angeles. The Corona Police were called and quickly went out to the location of the discovered box. A cause of death was unable to be attained for Baby Jane Doe, and her DNA was searched against a database but turned up no results, according to Fox News. 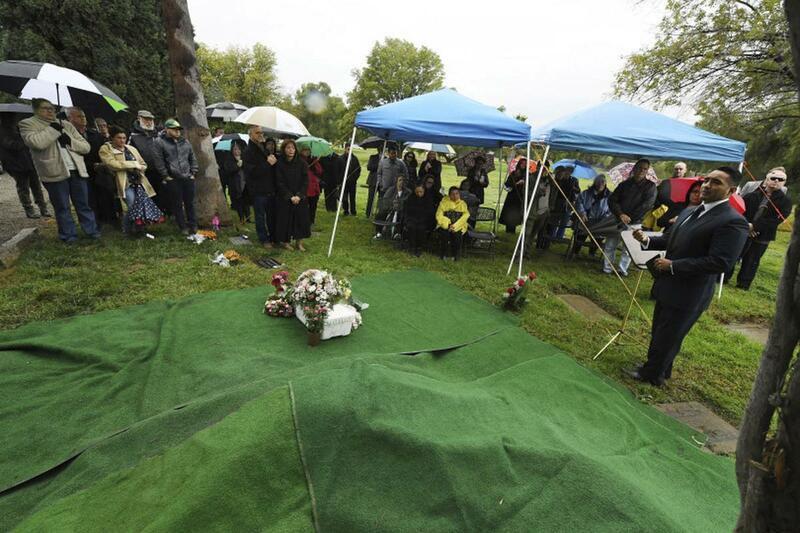 Various groups of people stepped up on the newborn’s behalf and provided a beautiful burial and ceremony for Baby Jane Doe. Sgt. Chad Fountain couldn’t just leave the baby’s body unknown and forgotten, saying, “We just wanted to make sure that the little girl got a proper burial,” according to the Press Enterprise. The service had many attendees from the community and featured a small white casket covered in petite white flowers, surrounded by stuffed animals. First Baptist Church of Corona pastor Jon Castillo, who also happens to be the police chaplain for the county, came to say a few words at the ceremony. This message is all too forgotten in a fallen world. The age of the child does not diminish it’s worth and value, all humans have intrinsic meaning and purpose. One woman at the funeral was seen dropping a pink stuffed animal into the burial site with the small coffin. Marilyn Aguilar said, “It touches your heart. I just thought that coming out and showing support for this unknown baby was something we had to do,” reported Fox News. The city provides many different Safe Havens, as the Corona Police reminded everyone, where you can drop off an infant safely within 72 hours of birth no questions asked. It is devastating that with the convenient and discreet option of dropping the infant off at a Safe Haven site, someone still decided to leave a newborn on the side of the road. Every state in the nation has a Safe Haven Law, where you can drop off infants at a hospital, police station, or fire department. According to WAFB 9, the parent can even get the baby back if they decide within 30 days that they have made the wrong choice. Safe Haven Boxes, signified by the blue logo with a baby in open hands, have given refuge to 3,543 babies as of 2017, according to their official website. With over a thousand newborns still abandoned, and almost 800 found deceased in the U.S., the message of Safe Havens needs to be spread and encouraged. It’s unfathomable how a mother can abandon her child, but when it does happen they should be left in a space that keeps them safe and gives them to someone who will love them. Bless the people who gave little Baby Jane Doe some recognition, gave her a voice when hers was taken from her. Please let us know in the comments section if you have heard of success stories with the Safe Haven boxes.